Bernardo Alberto Houssay was born in Buenos Aires, Argentina on April 10, 1887, one of eight children of Dr. Alberto and Clara Houssay, who had emigrated to Argentina from France. His father was a barrister. His early education was at a private school, the Colegio Britanico. He entered pharmacy school at the University of Buenos Aires at the age of 14, graduating in 1904. He continued into medical school, graduating in 1907. After graduating he took a position in the physiology department and completed his thesis on pituitary extracts, which won a university prize. In 1910 he was appointed Professor of Physiology in the university's School of Veterinary Medicine. During this time he continued his hospital practice, becoming the Chief Physician at Alvear Hospital in 1913. In 1915 he took charge of the Laboratory of Experimental Pathology at the National Public Health Laboratory in Buenos Aires. In 1919 he became the chair of the Department of Physiology at the University of Buenos Aires. In 1943 he was removed from his position by the Peronist Argentine government for expressing his opinion that Argentina should be more democratic. Although he recieved many invitations from overseas he remained in Argentina and continued his research, setting up the privately funded Instituto de Biologia y Medicina Experimental. In 1955 he was restored to his university position when a new government took power. Although Houssay researched many aspects of physiology, his primary research was endocrine glands. Endocrine glands are a glands that secrete hormones directly into the blood without a duct. Endocrine glands include the pitutary gland, the pancreas, ovaries, testes, thyroid, and the adrenal glands. His studies of the anterior pituitary gland led him to discover the relationship between its hormones and carbohydrate metabolism. In 1947 he won the Nobel Prize for Physiology in Medicine, which he shared with Carl and Gerty Cori, for "his discovery of the part played by the hormone of the anterior pituitary and the metabolism of sugar". 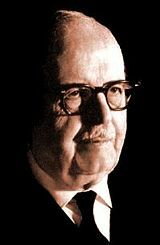 Other honors won by Houssay include twenty five honorary degrees and membership in the Argentine National Academy of Medicine, the Academy of Letters, the National Academy of Sciences of Buenos Aires and the Pontifical Academy of Sciences. He died on September 21, 1971.